Bureau of Energy Efficiency (BEE) and Central Public Works Department (CPWD) signed an MoU for energy efficiency in CPWD managed buildings and to promote designs and construction of new buildings under Energy Conservation Building Code (ECBC). 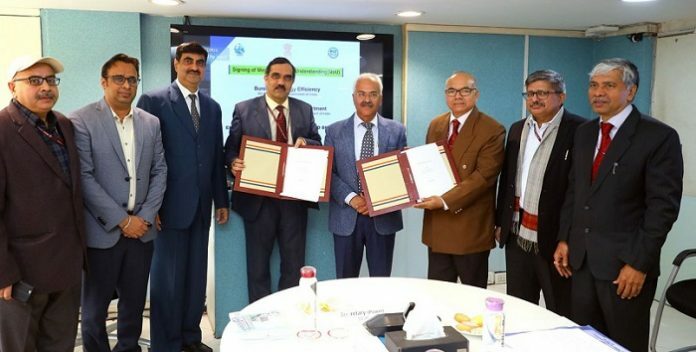 Bureau of Energy Efficiency (BEE) and Central Public Works Department (CPWD) signed an MoU for energy efficiency in CPWD managed buildings and to promote designs and construction of new buildings under Energy Conservation Building Code (ECBC). Ajay Kumar Bhalla, Secretary of Power, Government of India, Abhay Bakre, Director General, BEE, Prabhakar Singh, Director General, CPWD and other senior officials from Ministry of Power, BEE and CPWD witnessed the event in New Delhi in January. In the first stage approximately 150 buildings will be taken under star rating scheme and to promote energy efficiency in CPWD managed buildings. It is anticipated that this initiative will result in energy saving of more than 260 million units in the first stage with operational savings of about Rs 100 crore.